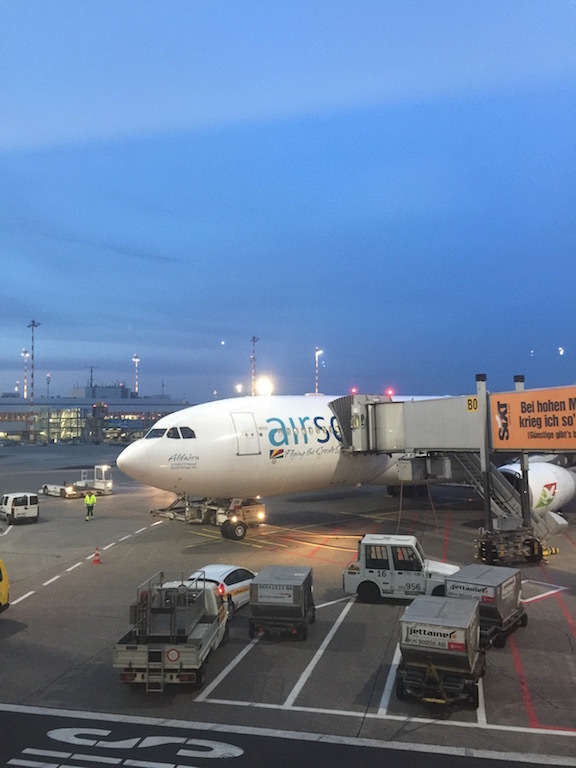 30th March 2017 saw Air Seychelles launch a new direct route to Düsseldorf, Germany. In the lead up to the launch of this exciting new European route, Air Seychelles offered some amazing deals for both day trippers (14hrs to explore the city) and those wanting a more relaxed long weekend away (4 days). Spotting a well placed Facebook ad, the ladies of Le Nautique Seychelles were lucky enough to secure some of these fantastic fares and last Thursday jetted off on the inaugural flight to Düsseldorf for a whirlwind weekend away. 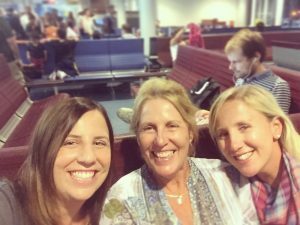 Arriving at Seychelles International Airport we were greeted like celebrities, having our photos taken on the red carpet leading up to the check in counters. We could tell that Air Seychelles had gone all out to ensure that this flight was one to remember. Boarding “Aldabra”, Air Seychelles Airbus A330, we were greeted by the beaming smiles of the Seychellois Cabin Crew and showered with gifts including an handy information pack on Düsseldorf, cozy neck pillow and a glossy certificate for being an inaugural passenger. The flight is a comfortable 10 hours and being a night flight we were able to sleep comfortably for most of the night, ready to hit the ground running on our arrival into Düsseldorf. We landed at sunrise and were greeted by water cannons signalling our arrival into this exciting new city – what a welcome! 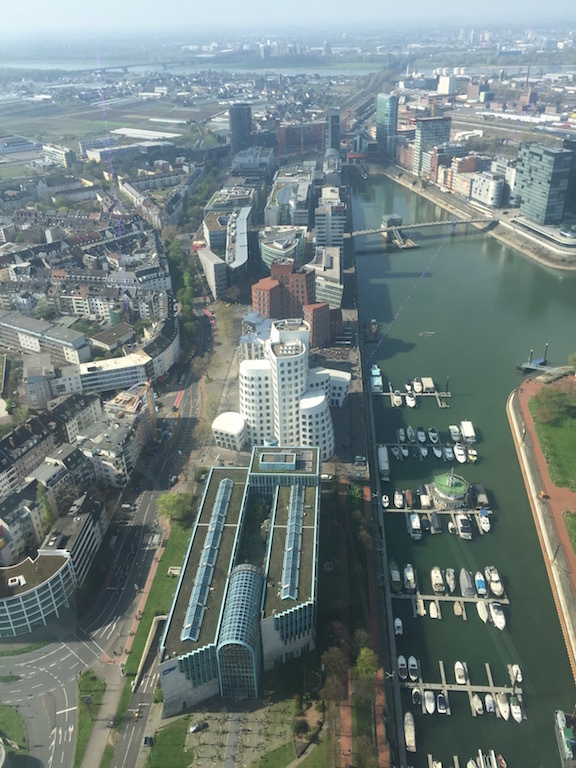 Düsseldorf city centre is a quick 20 minute taxi or train ride away from the airport. 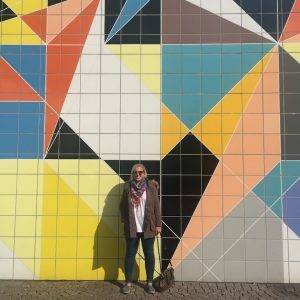 We opted to stay at the centrally located “Holiday Inn Express – Düsseldorf City” which was within walking distance to the main shopping precincts of “Schadowstraße” and “Königsallee” (known locally as the Kö) – perfect for us shopping deprived island girls! 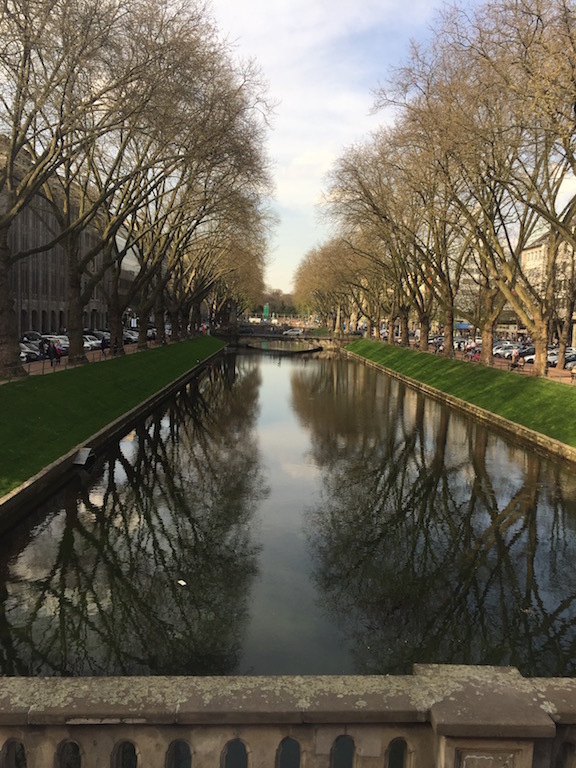 Firstly we cannot recommend the “Holiday Inn Express – Düsseldorf City” enough for a weekend escape – its just perfect if you’re looking for modern, clean and affordable city centre accommodation. Not only are the staff friendly and the rooms extremely clean and comfortable, the hotel also offers 24hr complimentary wifi and a tasty continental breakfast each morning. Fantastic value in our opinion. Being island girls we are extremely fashion deprived, so shopping was at the top of our weekend wish-list. 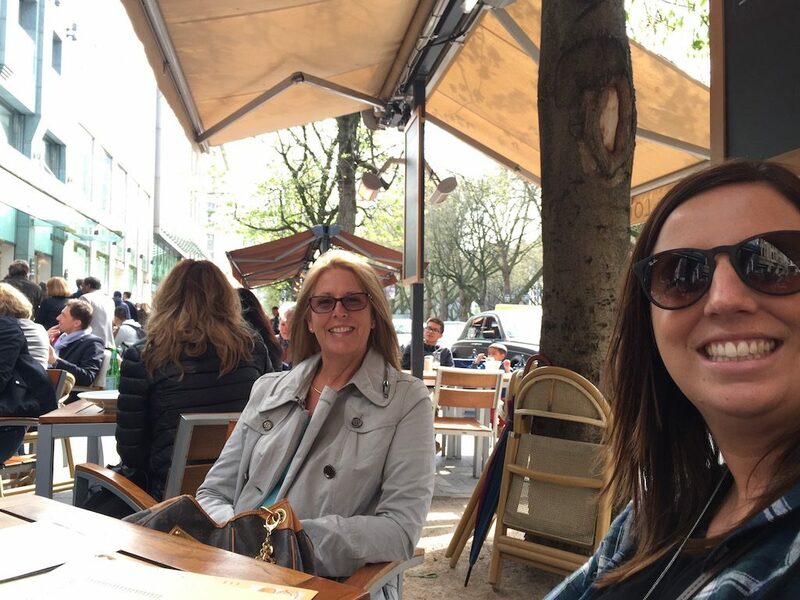 Thankfully Düsseldorf is renowned for being a fantastic shopping city, offering virtually every kind of shopping experience you could imagine. Start by walking the lively Schadowstraße. Here you will find most of the European high-street labels as well some great shopping arcades, department stores and cafes. 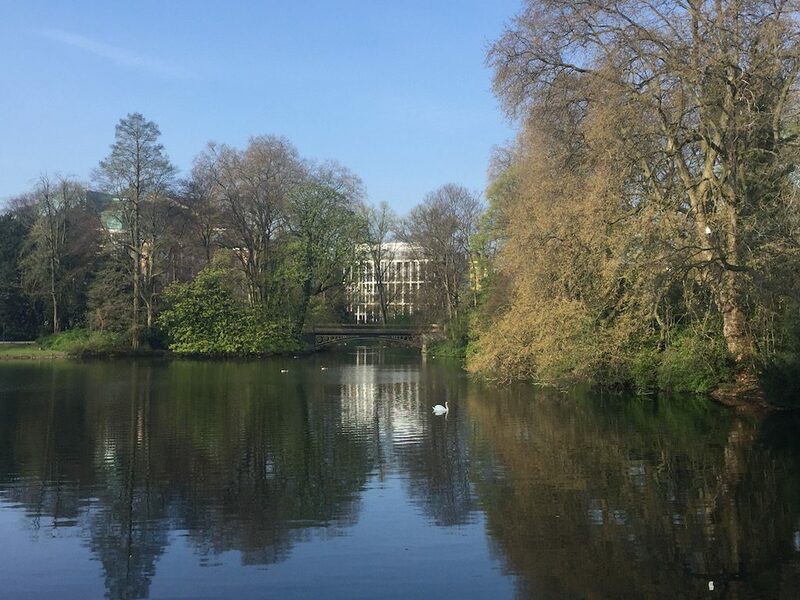 We also recommend you check out the luxury brands of the exclusive Königsallee, pausing for a cocktail or coffee at one of the many alfresco cafes so that you can rest your tired feet, enjoy the beautiful tree-lined canal and also engage in some serious people watching (always fun!). From here head across the tram-tracks towards the Rhein and the legendary Altstadt (Old Town) where you will find a variety of quirky boutiques, authentic German restaurants and over 260 pubs (known as the longest bar in the world), where you can sample the towns famous, locally brewed “Altbeer”. (FYI.. it’s possible to get a tax refund if you’re traveling from outside of the European Union. German VAT generally represents 19% of the total bill. 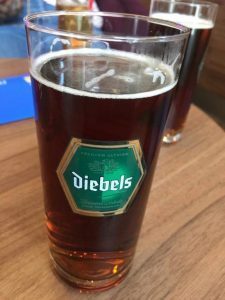 Look out for the Tax Free Service sign in the stores and ask for a Tax Free Cheque upon purchase, then claim it at Dusseldorf Airport). When visiting a new city we always make a beeline for the local “hop on, hop off” city bus tour – it’s the best way to get acquainted with a new city and familiarise yourself with the must-see tourist attractions on offer. The Düsseldorf open top bus tour departs from the tourist information centre adjacent to the Hauptbanhof (central train station), costs 15 Euro (adults) and lasts approximately 1.5hrs. We didn’t even hop off, just cruising around the city enjoying the sights and running commentary. 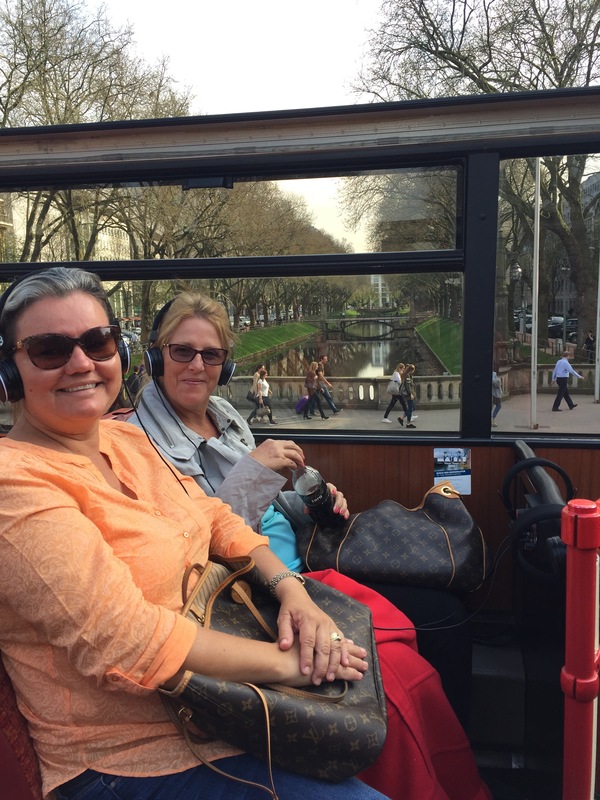 For more information on the open top bus tour visit the Düsseldorf Tourism website. 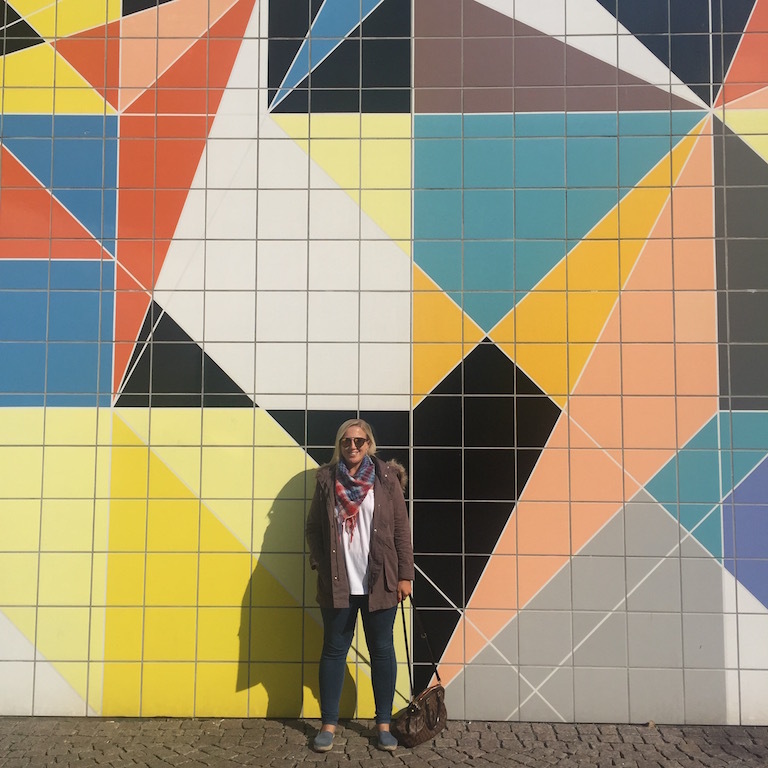 Apart from being the home of Düsseldorf’s famous Altbeer, Altstadt (Old Town) also boasts many fantastic art and cultural hotspots including the popular Kunstsammlung Nordrhein-Westfalen, the innovative NRW-Forum, the venerable Museum Kunstpalast and the Filmmuseum. 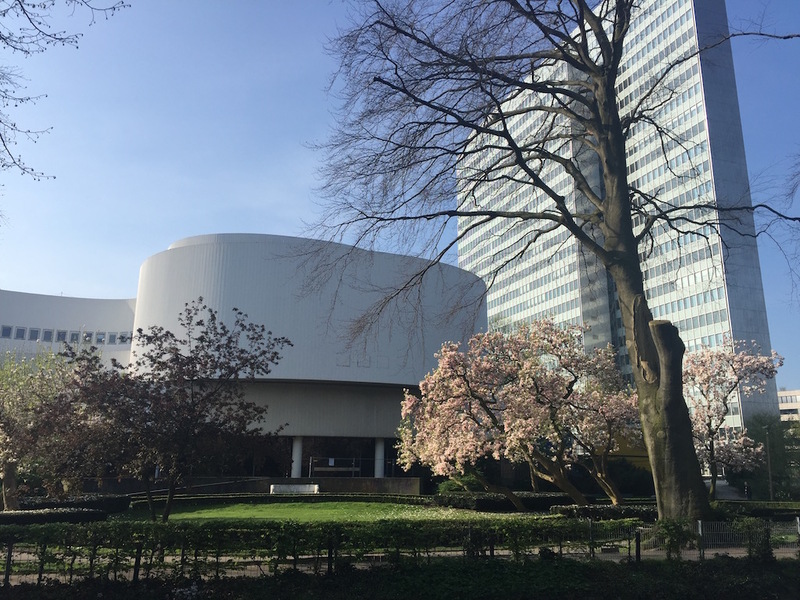 Not to mention the many performance venues including the Deutsche Oper am Rhein (Opera House), the Düsseldorfer Schauspielhaus (Theatre) and the Tonhalle (Concert Hall). Düsseldorf’s centre is also home to some an array of beautiful churches. 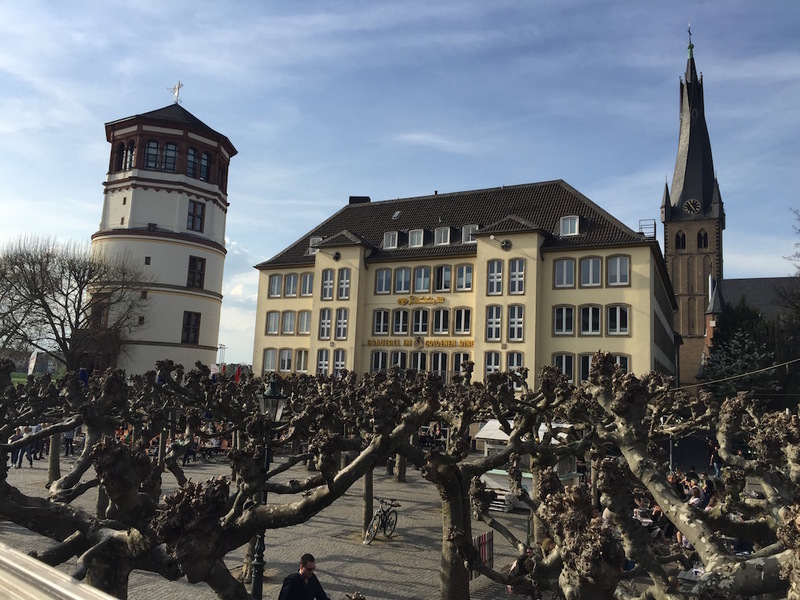 Our top pick was the 13th century Sankt Lambertus Basilika, which features a twisting spire which adds to Düsseldorf’s quirky skyline along the River Rhein. 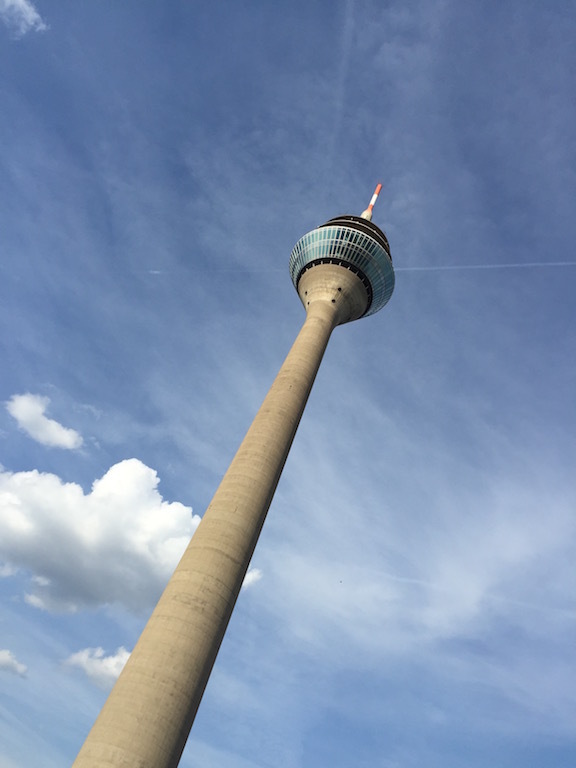 Head up the 240.5 meter tall Rheinturm tower for a fantastic 360 degree birds-eye view of this wonderful riverside city. 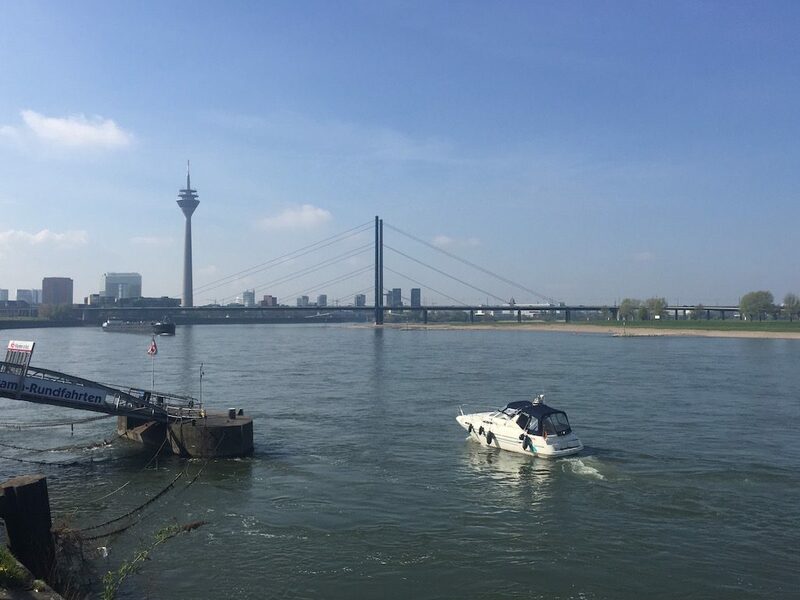 A striking landmark in the Düsseldorf skyline, enjoy a breathtaking view of the architectural MedienHafen, the Altstadt, the Hofgarten (central park), Königsallee, Rheinuferpromenade and Rhine with its many bridges. Be sure to sample the fantastic German food on offer in the many local pubs around the city. We can highly recommend you share the “Das Beste Von Allum” (Specialities Sample Platter) at one of the Frankenheim pubs. 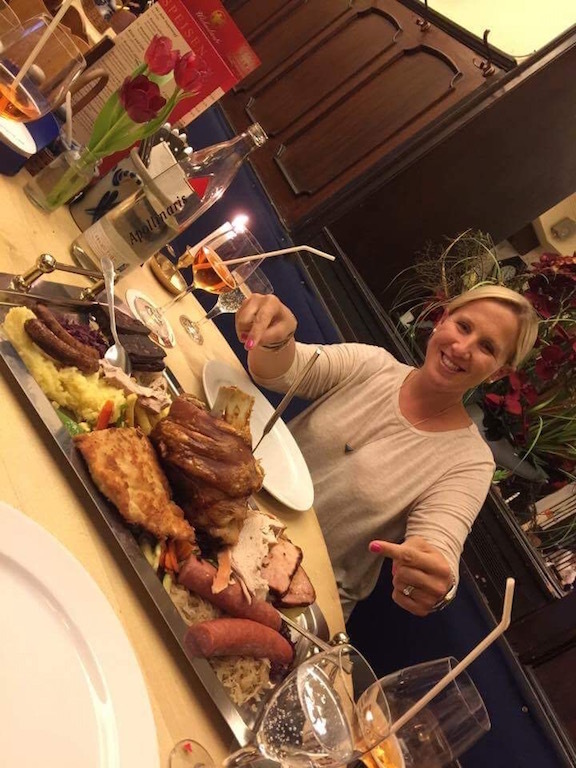 A word of caution… come hungry as the platter is HUGE and so tasty that you have to try everything (4 people could easily fill themselves on a platter for 2)! If you are interested in modern architecture then the MedienHafen (marina) is the place for you. A short stroll along the river from the Rheinturm tower, you can see quirky, futuristic buildings designed by the likes of Frank O. Gehry, David Chipperfield, Joe Coenen, Steven Holl and Claude Vasconi. All business by the day, the MediHafen transforms into a trendy hotspot by night with an array of fantastic restaurants, uber-chic cocktail bars and quirky cafes. 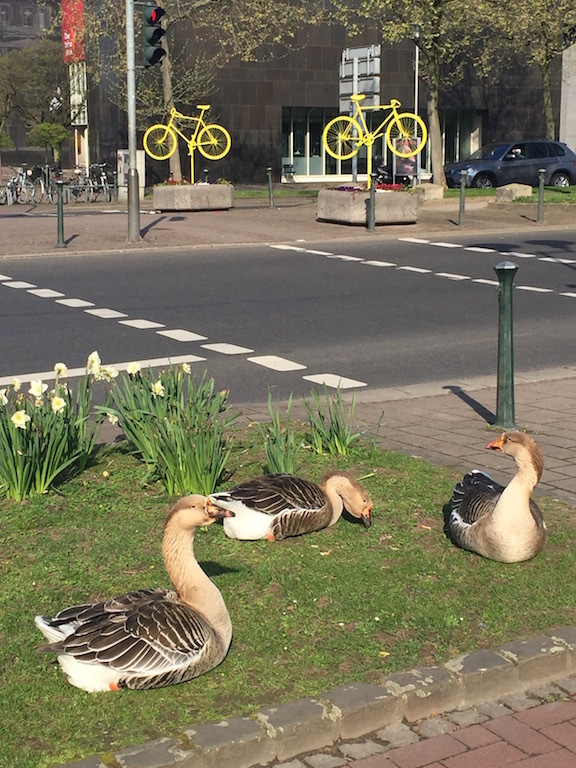 Sundays in Düsseldorf are a quiet, family affair. 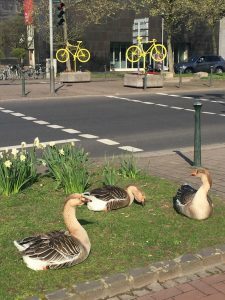 Shops across the city are closed so that residents can enjoy all the city has to offer, from their museums, to the riverside restaurants and pubs in Aldstadt to the miles of greenspace across the city. Being a wonderful spring weekend, we enjoyed a stroll through the local park towards and along the Rheinuferpromenade. As you can see we squashed quite a bit into our long weekend and we loved each and every minute of it. We will certainly be back to this beautiful city and enjoying the journey once again with Air Seychelles. 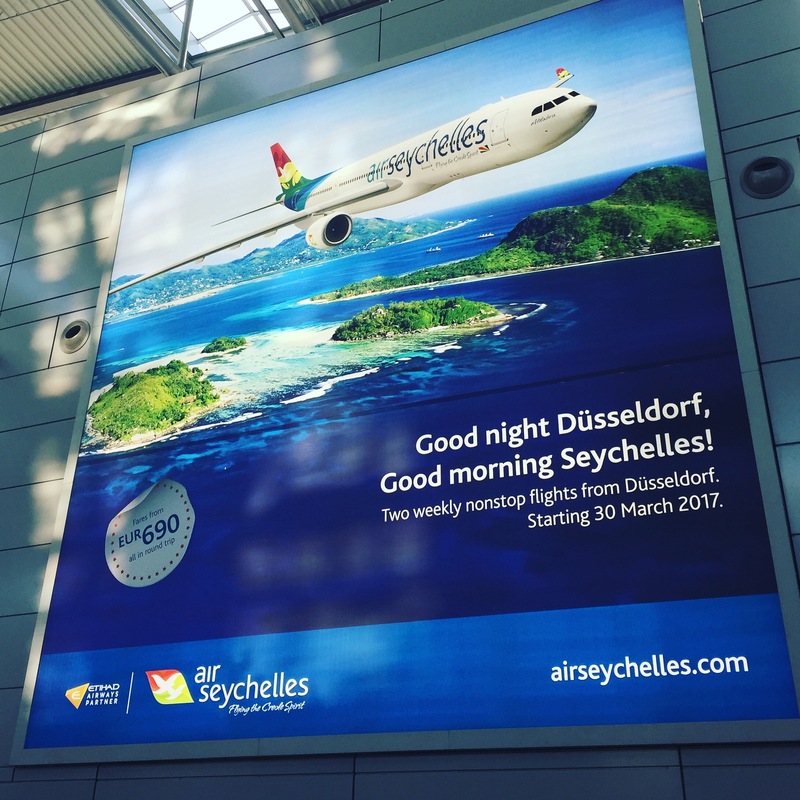 Thank you Air Seychelles and thank you Düsseldorf. We look forward to welcoming you to our slice of paradise one day in return. See what our guests have been saying about us right here.